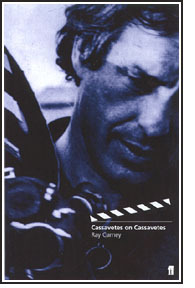 This page only contains excerpts and selected passages from Ray Carney's writing about John Cassavetes. 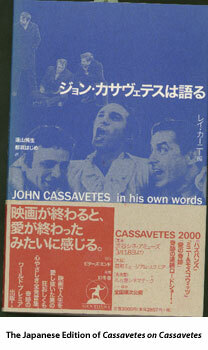 To obtain the complete text as well as the complete texts of many pieces about Cassavetes that are not included on the web site, click here. A script is a series of words strung together. They kind of spell out the story in a mysterious way I deal with the characters as any writer would deal with a character. There are certain characters that you like, that you have feeling for, and other characters stand still. So you work until you have all the people in some kind of motion. When I first start writing there's a sense of discovery. In some way it's not working, it's finding some romance in the lives of people. You get fascinated with their lives. If they stay with you then you want to do something – make it into a movie, put it on in some way. It was that which propelled us to keep on working at it. Making a film is a mystery. If I knew anything about men and women to begin with, I wouldn't make it, because it would bore me. I really feel that the script is written by what you can get out of it and how much it means to you, and if it means nothing to you, we start again and try to put ourselves up and communicate with you. The idea of taking a laborer and having him married to a wife who he can't capture, is really exciting. I don't know how you work on that. So I write – I'll do it any way [I can]. I'll hammer it out, I'll kick it out, I'll beat it to death, anyway you can get it. I don't think there are any rules. The only rules are that you do the best you can. And when you're not doing the best you can, then you don't like yourself. And that's very individual with everyone. The preparations for the scripts I've written are really long, hard, boring, intense studies. I don't just enter into a film and say, "That's the film we're going to do." I think, "Why make it?" For a long time. I think, "Well, could the people be themselves, does this really happen to people, do they really dream this, do they think this?" [There were] weeks of wrestling to get the script right. I knew hard-hat workers like Nick, and Gena knew women like Mabel, and although I wrote everything myself, we would discuss lines and situations with Peter Falk, to get his opinion, to see if he thought they were really true, really honest. I do a full and total screenplay and then the actors come to me and tell me what they don't like. I listen to them. Then I try to get deeper into the characters and find out what they want to play. In what they want to play, somehow they're adding to the film. They're adding their own sense of reality, and perceptions I wouldn't know from my relatively limited point of view. It's a necessary part of the process for me. If for me a line is right, I won't let the actors change it, but will allow them latitude in interpretation. I don't think audiences are satisfied any longer with just touching the surface of people's lives; I think they really want to get into a subject. Marriage, like any partnership, is a rather difficult thing. And it has been taken rather lightly [in the movies]. Family life is so different than what has been fed into us through the tube and through radio and through the casual, inadvertent greed that surrounds us. Films today show only a dream world and have lost touch with the way people really are. For me it's the first real family I've ever seen on screen. Idealized screen families generally don't interest me because they have nothing to say to me about my own life. Usually we put film in such simple terms while being endlessly involved in talking about our personal experience. We admit how complex it is. But it's as though we never look into a mirror and see what we are. So the films I make really are trying to mirror that emotion, so we can understand what our impulses are why we do things that get us into trouble, when to worry about it, when to let them go. And maybe we can find something in ourselves that is worthwhile. We looked at maybe 150 houses in Los Angeles. It was really hard to find something in the right price range that would make you feel you were in a real house and also depict the kind of blue-collar existence we had in mind. Some of the houses we scouted had plastic covers on everything, plastic pictures on the walls, and most of the family's money went into electrical appliances. That's a very real thing, but we didn't want it. So we decided we needed a hand-me-down house and finally found one that had been given to the Nick character and still had all the old furniture and old woodwork. We decorated to correspond with the characters: sporting trophies, photos of the children. Everyone brings their own ideas. For instance, should the house be painted? We painted the front but not the back, which could have been painted by some friends in exchange for a couple of beers, but was left as it was. [We decided Nick] was too busy worrying about his family. The actors [discussed] the clothes they will be wearing, the influence of money on their lives, the lives of the children, why they sleep on the ground floor, etc. Everything was discussed, nothing came from me alone. The location could have been a serious problem. At first everyone said, "How can you do a picture where 80% of it happens in the same house?" I think that's one reason why we had such difficulty financing the picture; it didn't seem to have enough movement, enough openness. But we decided we wouldn't try to exploit the house or make a "thing" of it. So most of it was shot in the dining room and the foyer, basically from two angles. One good thing about the house, of course, was that we could shoot all the sequences there in continuity. [I] directed it in chronological sequence, just as it would have been lived. I used long, long takes so that the actors could develop emotional scenes without interruption. 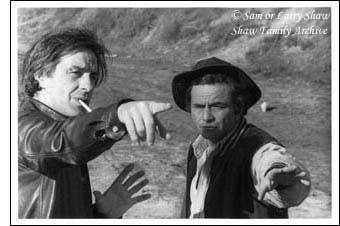 The shoot, which ran six days a week for thirteen weeks, was Cassavetes' most emotionally demanding. Making the picture was tough. Once we began shooting, it was hell. The emotional strain was so great that we never went out, socially, for thirteen weeks. No movies, no parties, no home entertaining, nothing. At night we'd collapse, make coffee, then start talking about the work. Yesterday's work, last week's, last month's, next week's, next month's. We'd wake up in the night, and talk some more. It was that kind of total commitment. Sometimes the tension on the set was so great we could taste it. We'd quarrel, and somebody would say, "No, that scene isn't true, it isn't honest, let's do it again." We sat around the [Longhetti] house and again talked out every scene until it seemed right, seemed right in this particular environment. It was hard work. It was disciplined work. It wasn't free-wheeling, you didn't feel like going out after the shooting. Every time we make a movie it's always going to be fun and it never is. In the ultimate finish of our relationship on that film it never is fun. It's always, you look back on it with a great feeling of what a grueling adventure that has been. [In] directing you're really like a host, that everyone's going to your party, and it's very difficult for [the crew] to help you get glory. Once they trust that you really are interested in the work, and not in your own perfection, they will work very hard for you. The actors are the same. They don't want to be second fiddle to a camera. When people begin to feel a little upset, there begin to be mysteries about filmmaking. There are no mysteries to making films. There is no mystery to writing. I try to make it comfortable for the actor by realizing what they're doing is so personal. If you're doing a movie and somebody slaps a slate in front of you and everybody stands around expecting you to be brilliant, then it's gonna be like a contest. I like to develop an atmosphere where that doesn't exist; where nobody is looking at you to see how good you are; where people can function. It's very hard to let the technical processes of film take over and then expect the actors to reveal themselves. I mean, you can't take a shower at a dinner party. You make a movie to tell what you know about life – about your life. But after waiting around for eight hours, for set-ups, for lights, all of it, when it comes time to shoot, you're thinking, 'I don't wanna tell you about my life anymore! Why should I tell you about my life!' On a set there's really a lot that can hamper the actors. For example, in this film, here's maybe the most important moment in two people's lives: a guy is committing his wife to a mental hospital. [In other movies] someone is also fiddling with your hair, putting lipstick on you, placing lights above you, sitting you down, marking your feet, moving cameras, yelling, "Hey, she doesn't look good; her skin is out of focus." Now, I ask you, how can the actors concentrate? So we do all this before the actors come on-stage. We all work quietly, and hopefully efficiently, and get it done. Rehearsals are tiresome, boring, and the whole crew becomes a kind of audience. If the crew gets bored, the actors feel that it's bad. That is why I want everything to go fast, and used long focal lenses and a set that has some depth. What's important to me is just that you convince the audience and yourself that what's on the screen is really happening. [The crew doesn't need a rehearsal because] they watch [all of the preparation]. In other words, everyone always rehearses. They're rehearsing for hours. They're rehearsing or walking around, doing the scene for hours. [The only way a crew member wouldn't know what's going on is if] you're out playing cards, if you're out talking, or making points with the producer, or Elaine May comes on the set and you want to get her coffee. Then you'll blow the scene, you know? If you really are interested, you have lots of time to know what's happening. We deal with thoughts and emotions and I hope that the actors don't feel that the material is scripted. So they don't think of the script. Everything must find its inspiration in the moment at hand. The words are there but two very good actors must want to express more of their love than by just reading the script. Only in this way can they really believe in their characters and express them. It really is a product of a group of people coming in and interpreting their roles. Really, truthfully interpreting their roles. Everything that Gena did she did herself. Everything that Peter did he did himself. Everything that all those other actors did, they did themselves. I give a lot of house – if there's any credit to be given it is to the people that worked behind the camera who are the damnedest crew because they really were for the actor and put themselves second. And if they saw something wrong they just went like this [makes a tiny facial gesture], but didn't let anyone else see it, you know? We would light generally. Light the whole picture generally and let the actors play it to the best of their ability. I would never tell an actor that he is doing it wrong or that it doesn't connect with my interpretation. I expect the actor to give me his interpretation. Obviously, if he is lazy or doesn't take his part seriously, then I get out my knife, my gun, my fist, and I kill him! I believe I have a gift as a director, being able to create an atmosphere in which people can act naturally in any given situation. I don't try and control the scene, which is often confused, anarchic, with the actors sometimes in league against me! 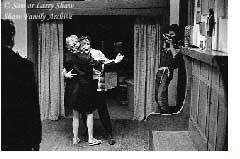 People talk about improvisation as if I say, "Everybody does what they want," and I take a camera and a movie comes out. It doesn't work that way. Anybody who knows anything about film knows that's crazy. Unless you're shooting a war maybe and even there you have to look for action. There are no accidents in this sense of the specific. A camera breaking down a location not available me being broke those are accidents! You stay up all night long and worry a film to death. To make the assumption that things just happen like that is amazing to me. It doesn't happen that way with actors. There's a lot I don't understand. If I say we're gonna make a picture and we don't know what we're doing, I'm absolutely straight when I say that. I don't think that Gena has any idea when she comes on the set that she's going to be able to break down, have a commitment scene, be frightened when she comes in. I see her when I come home at night and I see her on the bed with the script and I see her going over it and thinking about it and relating to everything and preparing herself and asking me questions. I mean, Gena reads this script and she takes and interprets that woman as someone that is innocent. That's not my interpretation. That's not in the script. You could interpret it as a person that fights it. She interprets it as someone that's innocent. She's crazy, but she's shy, too, really. She's not an outward person really. She's outward because she thinks she's supposed to be. She wants to please somebody. Gena has a lot of consideration for the character and the woman behind the character. She tries never to vulgarize or caricature people she's playing. She really resisted turning Mabel into a "victim" or a "case" or a "feminist." That was her insight. I'm totally an intuitive person. I mean, I think about things that human beings would do, but I just am guessing – so I don't really have a preconceived vision of the way a performer should perform. Or, quote, the character, unquote. I don't believe in "the character." Once the actor's playing that part, that's the person. And it's up to that person to go in and do anything he can. If it takes the script this way and that, I let it do it. But that's because I really am more an actor than a director. And I appreciate that there might be some secrets in people. And that that might be more interesting than a "plot." All people are really private – as a writer and a director, you understand that that's the ground rule: people are private. 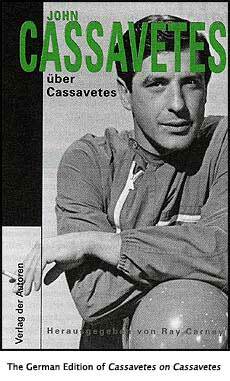 Almost every actor who worked with Cassavetes felt frustrated some of the time during the shoot. They felt they desperately needed an explanation of some fact or motivation; they craved a piece of information about their character; they pleaded with him to tell them something they needed to know; and, in almost every case, he refused to give them an answer. He would double-talk them; he would give a meaninglessly vague response; he would stand silent and look them deep in the eyes; but he would not give them a direct answer. OGD: How should I play this? OGD: Well, yeah, John, but . . . Thus it went, four or five times in a row, until Dunn gave up in frustration and bewilderment. It's the same sort of apparent inarticulateness that drove Peter Falk crazy during the filming of Husbands. It's not that Cassavetes could not have given a long, articulate explanation. It's that he knew that if he wanted Dunn to act convincingly hesitant and uncertain, the last thing he could ever do was to tell him to act that way. Actors always want to know, how is it all going to work out? I don't know. Where does it lead? I don't know that either. The actor has to make a decision. I hate control. I'm not a leader. I'm only happy where there's total confusion, where people function on their own level. You don't know what's gonna happen. You're meeting twelve strangers and you see a bunch of people standing behind the camera and there are lights all over the place and obviously it's being lit for one specific area because all the lights are there. So you see that and you don't know what you're gonna do! So the question is, at what point do I reveal what's going to happen? My system is never to reveal it! My system is to create as much confusion as I possibly can so the actors have the full knowledge that they're on their own, that there is nothing I'm ever going to tell them, ever, at any point in the thing. Except if somebody would say, "I think I'm going too far," I would disagree with them. Or if somebody would say, "Let's take a break," I would disagree with them, you know? Or if somebody would small talk. In other words, "You are now to reveal your life and parts of your life that you don't even know exist." I refuse to let myself or my characters seek refuge in psychology either for purposes of motivation or character analysis. Cassavetes deliberately created a state of insecurity in certain actors for certain scenes. Dr. Zepp was played by Eddie Shaw, Sam Shaw's brother. Eddie was a sweet and gentle man, but as a novice non-actor he was extremely insecure about what he was doing. 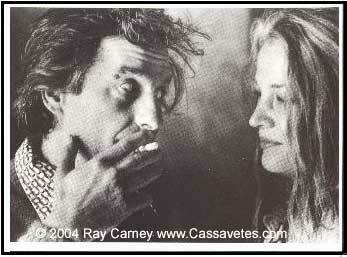 He barraged Cassavetes and everyone else on the shoot with demands for reassurance – "How was I?" "Do you think that was right?" "I didn't know if you could see my face since I was turned away." "Was it good enough?" "Tell me exactly what you want me to do in the next scene." 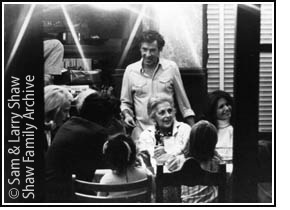 Cassavetes was annoyed by the questions and was quite stern with him (as he was with many of the non-professionals on the shoot); but he knew better than to attempt to stop them by answering them. He realized that the actor's tentativeness could enrich the characterization. I don't want big, long discussions; I don't want to know what they're thinking. If an actor tells me, "Look, I'm going to be this," and then tries to do it, he's putting untold pressure on himself. Eddie Shaw, he's the producer's brother, came in, and we didn't have anyone to play the thing, and he said he'd play it. It was the greatest thrill in his life to play this doctor, so when he came in he kept on saying, "What do I do?" I thought, "That's wonderful! That's a great kind of a doctor to have! That's the doctors I've known!" [Laughs.] This guy says, "Where does it hurt?" Why should I tell him? Mario Gallo (who plays Mr. Jensen) was another friend whose personal feelings became part of his performance. Gallo was not entirely comfortable with Cassavetes' direction and was fairly awkward or tentative in his playing, but Cassavetes realized that his "nervousness" should not be eliminated, but should be 'used' in his performance. These are fairly minor cases. Cassavetes' treatment of Rowlands and Falk is a textbook example of the use of psychology to massage souls and spirits. His relationship with Rowlands was extremely rocky at times (to the extent that at one point he told her he would never work with her again). Rowlands on her part felt lost at moments and desperately in need of help, which Cassavetes seemed at times deliberately to withhold. Prior to shooting the homecoming scene, Rowlands pleaded with her husband for guidance. It was months into the shoot; she was tired and confused; more than information, what she probably needed was a little reassurance. Cassavetes not only refused to provide it but undermined what little confidence she had left with the coldness and distance of his response. She wanted to be calmed down; he did everything possible to work her up. GR: What do you want me to do? JC: I don't want to tell you. What would Mabel do? GR: I don't know. Help me. Please! Come on! You could help me! Take me outside. I don't know what she's . . .
JC: Gena, that's enough! I refuse to talk to you. No more! By this point Rowlands was glaring at him, really irritated and upset. She was no longer pleading but angry, and started yelling at him, protesting at the way he was treating her. Instead of trying to calm her down, he then started taunting and mocking her back. The moment built with exchanged charges and countercharges. 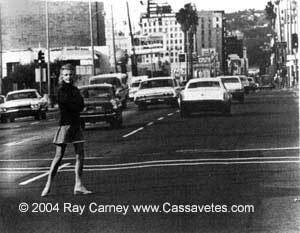 Then Cassavetes suddenly turned on his heels and walked away, leaving Rowlands alone in front of the actors and crew. A few minutes after that, without saying anything else, he gave the order to shoot the scene. If the result was not one of the greatest performances ever captured on film, Cassavetes' treatment of Rowlands could be called heartless and brutal. What is even more interesting is that when the cameras rolled Rowlands gave Cassavetes something he never expected. It seems clear in retrospect that he was deliberately winding her up to get anger, resentment or bitterness out of her in the scene; but in response she gave innocence and vulnerability. Just as he was shocked into dropping the camera during the breakdown scene, Cassavetes later confessed that he was bewildered by the choices that ensued. When Gena was committed by Peter and she went to an institution, and as the film says, six months later she comes out – I would have thought that she would be so hostile against her husband. But she comes in the house and she never even acknowledges his presence. She's only considering her children. And we did a take, and I thought, "Should I stop this? I mean, she never looked at Peter." She walks in the house and everyone greets her and she never looks at her husband – I mean, she looks at him, but she never sees him, yet she's not avoiding him. And I thought, "Well, that's that defenseless thing carrying itself too far here! What are we doing?" All through that homecoming scene I was astounded by what was underneath people, what these actors had gathered in the course of this movie. And I was way behind them. I was staggered because Gena was so quiet and mild. She wasn't hostile at all. I started yelling because I thought she was acting so the audience would like her, but I was wrong. She was expressing fear, which separated her from the people she loved. At the moment when Nick's mother, Mabel's enemy, subtly changes her approach in the most malicious way, just at the moment when the audience is hoping that Mabel is going to get out of there, Mabel stays so tender. She wants to stick with her family to the very end. If she'd come back from the asylum with hate in her heart, the film couldn't finish the way it does. Gena's interpretation showed me how frightened Mabel was. As a matter of fact, when we looked at the dailies, Gena said, "What do you think? I'm at a loss, did we go too far?" And I said, "I didn't like it, I just didn't like it at all." I mean, I found it really embarrassing to watch. It was such a horrible thing to do to somebody, to take her into a household with all those people after she'd been in an institution, and their inability to speak to this woman could put her right back in an institution, and yet they were speaking to her, and Gena wanted to get rid of them and at the same time not insult them. But then I thought what Gena did was like poetry. It altered the narrative of the piece. The dialogue was the same, but it really made it different. I would grow to love those scenes very, very much, but the first time I didn't. The film really achieved something really remarkable through the actors' performances, not giving way to situations but giving way to their own personalities. 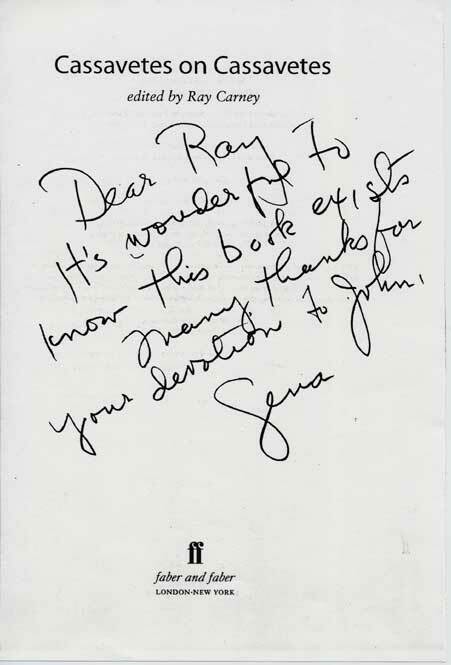 Gena had taken away the pettiness of women as a weapon. The woman in a sense became idealized; you took the purity of a woman minus pettiness. One of the things we had worked out in the beginning of the movie was that these characters could not be petty because you would lose the whole intention of what the film was about. Gena wasn't a hostile person and didn't use a weapon. Taking that weapon away made the woman extremely vulnerable. No one is defensive in the whole film. There isn't one shield on anybody's psyche, or anybody's heart. It's just open. It would be hard to find a clearer illustration of how Cassavetes' "non-directive directing" allowed his actors to give him things he couldn't anticipate. He learned things about his characters and their situations. He changed his mind as he went along. As the shoot goes on all these things that are happening are revelations to me also. I'm seeing Gena do this, and Gena as my wife now suddenly is becoming Mabel Longhetti and those pink socks are becoming something that you see on something. Those nice legs are becoming Mabel's nice legs and her manner of insanity is recognizable and suddenly she's not insane. These discoveries are happening to me, to the crew and to the characters. Photographs by Sam Shaw and Larry Shaw are used by special arrangement. They may not be used on other sites or otherwise reproduced. All ownership and copyrights are retained by Shaw Family Archives, LTD. More information is available at: www.samshaw.com and www.spc-promotions.com.